Gymnastics grips are used to protect the palms of your hands from blisters and burns during workouts that involve a lot of pull-ups. They are a popular tool used in Crossfit because many of the workouts contain a high volume of pull-ups. Crossfit athletes often do pull-ups using kipping, which is basically swinging back and forth to create momentum. Kipping during pull-ups makes the chances of blisters and burns much greater. Usually the grips have a velcro strap that secures around the wrist. There is a leather strap that covers the palm with holes for your fingers. 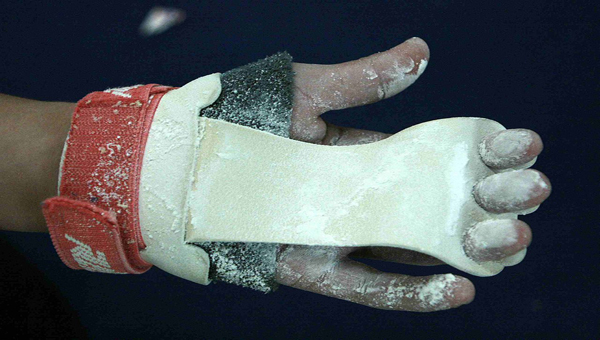 Often athletes will use chalk on top of the wraps, like in the picture above. The chalk increases the ability to grip a bar when your hands get sweaty.